Process mapping, which creates transparency and detail, is one solution to increasing efficiency in your overall lending operations. It shines a light on existing processes by identifying the specific steps and the amount of time for each step, so that they can be assessed and adjusted to increase efficiency. This concept was the focus of OFN’s May 5th webinar, Efficiencies in Lending, and CAMEO’s peer learning call the following week. Read Susan Brown’s article on how CAMEO’s MMS project creates an abbreviated process map for participating CDFIs. We developed a process map for five lenders, showing how many days it takes each organization for four lending steps: Auto Review (automated risk assessment of an application); Document collection; Underwriting; and Closing. Contact Susan Brown if you’re interested in learning more or participating in the MMS program. MMS, developed by LiftFund (formerly Accion Texas), provides instant risk assessment and fast, quality underwriting to support microlenders in scaling up and maintaining strong portfolio performance. Many of the borrowers that CAMEO microlenders serve aren’t able to access traditional capital for a variety of reasons – their credit is below bank standards, their business is too new, their cash flow is too tight. What happens to those borrowers, when they don’t quite qualify for the credit they want with a microlender? How do they build credit? Andrew Cole talked to our MMS users, who have adopted a variety of strategies to help those applicants build credit, including turning them into repeat customers. CAMEO’s educational campaign to inform California’s small business leaders and elected officials on what good capital looks met with good results at our annual meeting and advoacy day earlier in the month. We’re please to report that more than a dozen legislators showed various levels of interest/concern in responsible small business lending and we might even have found someone to sponsor legislation – if that’s the route we eventually take. We will continue our education campaign with an informational briefing on August 4 in Sacramento. The briefing **Small Business Needs** will be co-hosted by the Assembly Jobs, Economic Development and the Economy Committee, the Assembly Committee on Banking and Finance, and the Senate Banking and Financial Institutions Committee. Read our CAMEO Launches Campaign For BBOR. Learn more about good small business lending practices and the Small Business Borrower’s Bill of Rights. The Accion Network has a webpage to educate business owners on predatory lending. We encourage you to educate your clients and borrowers on how to understand online lending. Advances in technology and the availability of data are changing the way consumers and small businesses secure financing. Online marketplace lending has emerged as an industry offering faster credit for consumers and small businesses. Through this effort, Treasury took steps to understand the potential opportunities and risks presented by this evolving industry. The white paper, called “Opportunities and Challenges in Online Marketplace Lending,” was published after Treasury reviewed over 100 public comments on the issue. Among the top recommendations that emerged from their findings was to “support more robust small business borrower protections and effective oversight.” The report mentions the Small Business Borrower’s Bill of Rights as a best practice. 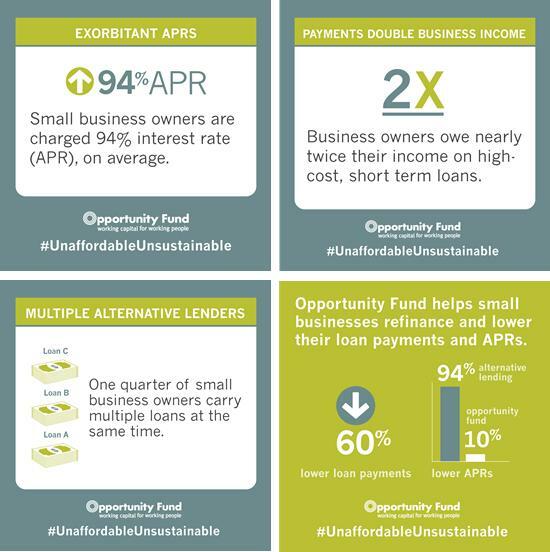 If you haven’t read Opportunity Fund’s unique report -: “Unaffordable and Unsustainable: The New Business Lending on Main Street” – then do it now! The team analyzed 154 financing transactions offered to small businesses seeking to refinance short-term, high-cost financing from alternative lenders. The report uncovers punishing loan terms from short-term, high-cost lenders, including an average annual percentage rate (APR) of 94 percent and an average monthly loan payment that is nearly double the owners’ net incomes. A bunch of interesting opportunities have crossed our desks. Because of a generous grant, Credit Builders Alliance members can become credentialed with Equifax for only $250. Your clients will benefit from your reporting to all three major credit bureaus. Contact CBA to get started. NerdWallet.com has developed an online tool to divert online consumers away from online payday loan vendors and toward local financial assistance or affordable financial products. Learn more and have your financial product/s featured on NerdWallet.com. TOOLKIT for Discovering God’s Economy was designed to give people of faith a practical experience in connecting their theological imagination with systems of finance. Criterion Institute invites you to participate in a one-day TOOLKIT Workshop on July 12, 2016 in San Francisco, hosted by the founder and president, Joy Anderson. You will learn about and practice ways to use finance as a tool for effecting social change in the world. The workshop will bring you together with churches and dioceses in our region that are interested in capital access for lower income business owners. At a core, the question is about how to bring a theological imagination to sustainable finance. CAMEO members receive a 50% discount with the code CAMEO. Some scholarships also available through CAMEO. Why APR Alone Isn’t the Answer In Small Business Lending. There’s momentum for responsible business lending. Obtaining capital remains a big hurdle for small and microbusinesses, a main finding of “The State of Small Business in America” by Babson College.